This Power Point was created as a filler for the end of the year or as a sub plan. 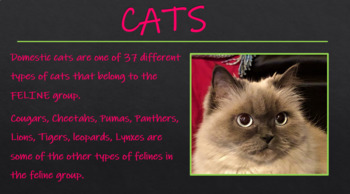 The first 6 slides are filled with fun facts about cats. 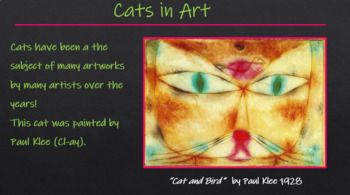 Slides 7-10 show cat paintings by artists: Klee, Picasso, Warhol, and Burch. There are some notes added to these slides. Slide 11 introduces the drawing assignment. 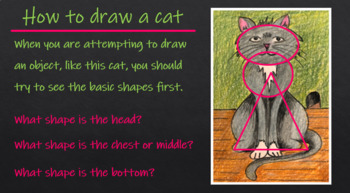 Then slides 13-24 have visual step by step directions for drawing a cat utilizing an oval, circle, and modified triangle. 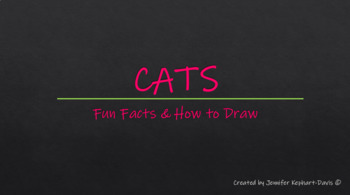 Slides 26-28 talking about outlining and coloring the cat drawing and the last slide lists the standards. This Power Point also comes with a step by step handout and a word search for those early finishers.